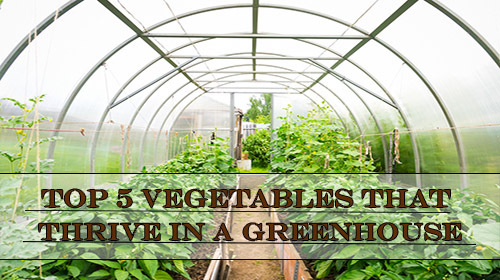 Using a greenhouse means you can grow vegetables at any time of year. While they were once used mainly for commercial purposes, many people have their own greenhouses so they can enjoy tending to a garden, no matter the weather. In this article, we are going to discuss the top 5 vegetables that will thrive in your greenhouse, even though there are many that do thrive. Let’s learn about these vegetables below! We realize there are several types of peppers, and yes, almost all varieties of peppers will thrive in a greenhouse. You have your pick at which peppers you want to use, as long as they have a container that is at least 8 inches deep and holds about 2 gallons. Peppers should be put at least 15 inches apart from each other and will thrive if the inside temperature is above 55 degrees. From red and green peppers to jalapenos, you won’t be lacking peppers throughout the year! They are very easy to grow, so it will be simple to get them to completion so you can enjoy them. For tomatoes to develop pollen, they need to have temperatures of 55 degrees or higher at night time. Various types of tomatoes can grow in a greenhouse, and they will be ready in just about 3 months. In order to grow tomatoes in your greenhouse, you should have a container that is a foot deep and holds up to 3 gallons. Place them two feet apart to grow, and be sure they get a lot of sunlight during the day. RELATED : Are these 8 common mistakes creating a tomato timebomb in your garden? Most green vegetables grow in a similar way, and you will need something that will be the base of your salad! Greens have different colors and taste, but from lettuce to cabbage and spinach, you will need leafy greens to keep your body healthy. They can be grown in rows alongside each other and picked at their peak. You can even grow micro greens, which include beet, radish, peas, and more. They make great side dishes and snacks. All greens are simple to grow and can be grown right next to each other so it will save space. Spinach is one of the most popular greenhouse plants, as well. Not only is it tasty, but you get so many health perks from it, like minerals and vitamins that your body needs to function. Easy to grow, the best way to enjoy it is to pick it fresh from your garden and then immediately cook it. For most greens, you should use a potting mix for seeds and plant them in small boxes with about 25 seeds in it. No matter what type of chilies you want to grow, they will thrive in a greenhouse. Red or green, you can grow one or both colors that will be grown in large containers that will hold the entire plant of chilies. When growing chilies, you will need temperatures to be at 18 to 22 degrees Celsius to germinate them. Seeds should be thinly put into trays and never to be over watered. Your compost needs to be damp but not overloaded with water. Soon, the seeds will have 2 leaves, and you can put them into bigger pots in a warm area. Once the plants have their roots, you can plant them in their larger container to finish growing. They will require sunlight and need to be watered at the same time regularly, as they can stop growing if there isn’t enough water. This is especially true when the weather is hot, as they will absorb more water during this time. While the plants are small, you should use liquid fertilizer to make the plant stronger. Of course, you can grow them any way you see fit as long as you have the proper knowledge. Cucumber is delicious and refreshing. If you do decide to grow them in a greenhouse, you must tend to them often, as it is not as easy as other vegetables to grow. Once you do pick them, you should wrap them in saran wrap so they can stay fresh after they have been harvested. Cucumbers can be a little tricky if you do decide to grow them in a greenhouse. For example, they do not need to pollinate. You will have to take out any of the male flowers to prevent such pollination. If you don’t do this, the cucumbers can turn out very bitter. While many stick to regular green cucumbers to grow, you may want to spice things up and try growing a yellow or white cucumber. They even come in a ball shape. If you are thinking about growing ridge cucumbers in a greenhouse, then you need to make sure that there is no cross-pollination as the ridge variety can make the cucumbers around them bitter due to the pollination. Overall, cucumbers are highly revered and many growers like to grow and harvest them from their own greenhouse as they taste better. You can take your proteins from vegetables but the best natural source is still lean meat. That’s why, in case of a survival scenario, hunting will be of extreme importance for you and your family. Having the best rangefinder can help with distance hunting for when you need to add meat to your vegetables. Growing vegetables in a greenhouse is a great way to live a healthy lifestyle. You not only tend to your own garden, but you get the vegetables that you like, and they will be fresh. This also means you don’t have to worry about pesticides or any genetic modifications with the plants. While not all vegetables are easy to grow in a greenhouse, the ones that we have listed above tend to thrive while in a greenhouse setting. We hope this article has encouraged you to not only grow your own vegetables, but to also invest in a greenhouse that you can use for many years to come!